One day I went to the shop to buy milk and came home with a goat called Billie! I had no idea what I was going to do with Billie, but I assumed it would all fall into place. I was wrong. My kind and unassuming husband was very surprised when I opened the gate to our home for waifs and strays with a goat in tow. The bearded animal snorted when he saw the garden. Heaven, he must have thought, a Billie Goats Heaven. I was a very kind but assuming wife, my husband said, to think that we could easily accommodate this animal that had one eye on the washing line and another on our prized allotment. But Billie was here to stay, at least for the time being. He didn’t make friends easily, which was probably due to his horns. These had the potential to toss an unsuspecting person into the air. And they certainly scared many of our friends away. And he escaped, once or twice, could have been more but I hate to think about it. Oh, the trouble it caused. 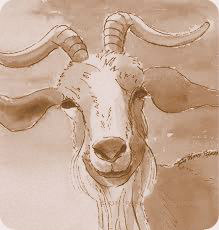 We thought that Gilbert the Great was a handful, but Billie the Goat beat him hands down. ‘He’s probably not far off old age,’ I replied and instantly felt sorry for poor Billie. I knew we couldn’t keep Billie indefinitely, our home for waifs and strays just wasn’t right for him. He shook his head and said that Billie deserved somewhere permanent. I agreed. It was after Billie got into the allotment, that we sought a new home for him. I asked Tom the Egg (he really did exist) if he would put some posters around the villages and off he went, on his new bicycle. Within two days, someone called and asked all about Billie. What he looked like, colour, size etc. When I had given them a full description, they asked if they could come to see him straight away. Well, what a surprise. Billie found a new home on the stage. He was to star in a play which was running for another four nights, then live the rest of his days on a farm close by. I have often been to visit Billie and delighted to write, that he is a happily retired acting goat. Goodnight Billie! I often wonder where you came from.